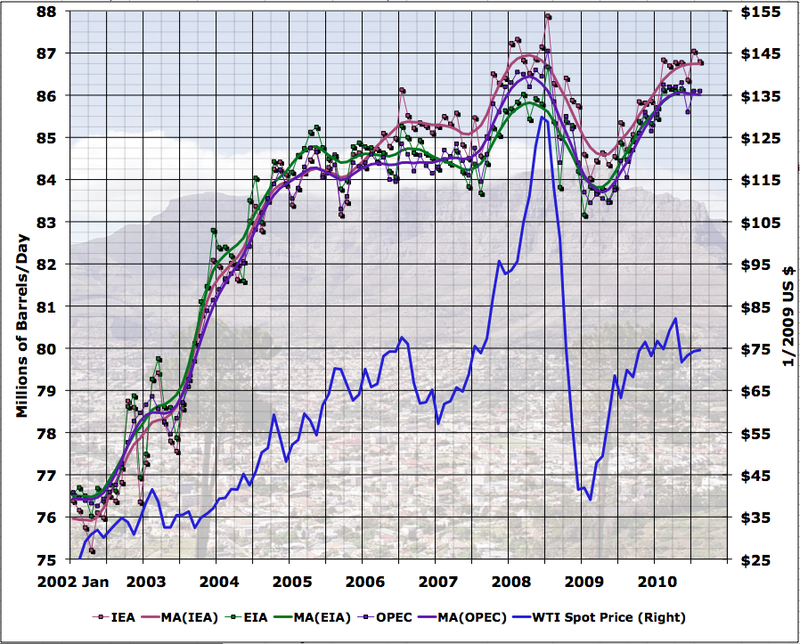 Interesting reading which suggests that "Peak Oil" has arrived in 2010 ! The article also outlines Potential Geopolitical consequences ! Reading between the lines we can deduce that, if Peak Oil actually occurs, our consumption based society will fragment and breakdown into disarray - unless of course alternative power sources can be brought on stream quickly !! The issue is so politically explosive that it's remarkable when an institution like the Bundeswehr, the German military, uses the term "peak oil" at all. But a military study currently circulating on the German blogosphere goes even further. The study is a product of the Future Analysis department of the Bundeswehr Transformation Center, a think tank tasked with fixing a direction for the German military. The team of authors, led by Lieutenant Colonel Thomas Will, uses sometimes-dramatic language to depict the consequences of an irreversible depletion of raw materials. It warns of shifts in the global balance of power, of the formation of new relationships based on interdependency, of a decline in importance of the western industrial nations, of the "total collapse of the markets" and of serious political and economic crises. The leak has parallels with recent reports from the UK. Only last week the Guardian newspaper reported that the British Department of Energy and Climate Change (DECC) is keeping documents secret which show the UK government is far more concerned about an impending supply crisis than it cares to admit. According to the Guardian, the DECC, the Bank of England and the British Ministry of Defence are working alongside industry representatives to develop a crisis plan to deal with possible shortfalls in energy supply. Inquiries made by Britain's so-called peak oil workshops to energy experts have been seen by SPIEGEL ONLINE. A DECC spokeswoman sought to play down the process, telling the Guardian the enquiries were "routine" and had no political implications. According to the German report, there is "some probability that peak oil will occur around the year 2010 and that the impact on security is expected to be felt 15 to 30 years later." The Bundeswehr prediction is consistent with those of well-known scientists who assume global oil production has either already passed its peak or will do so this year. ■Oil will determine power: The Bundeswehr Transformation Center writes that oil will become one decisive factor in determining the new landscape of international relations: "The relative importance of the oil-producing nations in the international system is growing. These nations are using the advantages resulting from this to expand the scope of their domestic and foreign policies and establish themselves as a new or resurgent regional, or in some cases even global leading powers." ■Increasing importance of oil exporters: For importers of oil more competition for resources will mean an increase in the number of nations competing for favor with oil-producing nations. For the latter this opens up a window of opportunity which can be used to implement political, economic or ideological aims. As this window of time will only be open for a limited period, "this could result in a more aggressive assertion of national interests on the part of the oil-producing nations." ■Politics in place of the market: The Bundeswehr Transformation Center expects that a supply crisis would roll back the liberalization of the energy market. "The proportion of oil traded on the global, freely accessible oil market will diminish as more oil is traded through bi-national contracts," the study states. In the long run, the study goes on, the global oil market, will only be able to follow the laws of the free market in a restricted way. "Bilateral, conditioned supply agreements and privileged partnerships, such as those seen prior to the oil crises of the 1970s, will once again come to the fore." ■Market failures: The authors paint a bleak picture of the consequences resulting from a shortage of petroleum. As the transportation of goods depends on crude oil, international trade could be subject to colossal tax hikes. "Shortages in the supply of vital goods could arise" as a result, for example in food supplies. Oil is used directly or indirectly in the production of 95 percent of all industrial goods. Price shocks could therefore be seen in almost any industry and throughout all stages of the industrial supply chain. "In the medium term the global economic system and every market-oriented national economy would collapse." ■Relapse into planned economy: Since virtually all economic sectors rely heavily on oil, peak oil could lead to a "partial or complete failure of markets," says the study. "A conceivable alternative would be government rationing and the allocation of important goods or the setting of production schedules and other short-term coercive measures to replace market-based mechanisms in times of crisis." ■Global chain reaction: "A restructuring of oil supplies will not be equally possible in all regions before the onset of peak oil," says the study. "It is likely that a large number of states will not be in a position to make the necessary investments in time," or with "sufficient magnitude." If there were economic crashes in some regions of the world, Germany could be affected. Germany would not escape the crises of other countries, because it's so tightly integrated into the global economy. ■Crisis of political legitimacy: The Bundeswehr study also raises fears for the survival of democracy itself. Parts of the population could perceive the upheaval triggered by peak oil "as a general systemic crisis." This would create "room for ideological and extremist alternatives to existing forms of government." Fragmentation of the affected population is likely and could "in extreme cases lead to open conflict." The scenarios outlined by the Bundeswehr Transformation Center are drastic. Even more explosive politically are recommendations to the government that the energy experts have put forward based on these scenarios. They argue that "states dependent on oil imports" will be forced to "show more pragmatism toward oil-producing states in their foreign policy." Political priorities will have to be somewhat subordinated, they claim, to the overriding concern of securing energy supplies. Of course I don't know for anything like certain but Thomas Will sounds more like a US name so there could be some US influence on this Bundeswehr report considering the Nato/US army/military presence in Germany since World War 2. And isn't the US well into all that peak oil stuff and that global warming stuff and such like. On the other hand the report might well be entirely independent and solely Bundeswehr as the article is trying to strongly suggest. And of course "leaking" it in Der Spiegel online for fairly general consumption tries to get readers used to the previously unthinkable idea of Germany having its own independent army again which I read somewhere they are thinking of doing. Nuclear energy and the problem goes away in the US for starters. Couple that with nat gas to power automobiles and oil is obsolete. Doesn't take much change on the auto thing either. If this was a wartime strategy it would already have been implemented. This peak oil stuff gets tiresome TBH. This peak oil stuff gets tiresome TBH. Then don't read about it. For those who are interested here's a piece that puts some doubts to peak oil having happened already: the reductions in production can easily be explained by a reduction in consumption. We are close to the moment of truth however, with current consumption trends we are supposed to pass the July 08 peak level anytime now. by Stuart Staniford 4 Average: 4 (4 votes) Please Log in or register to rate this article. Global oil supply fell 250 kb/d to 86.8 mb/d in August, as non-OPEC output dipped to 52.4 mb/d on seasonal maintenance in Canada, the UK and Russia. 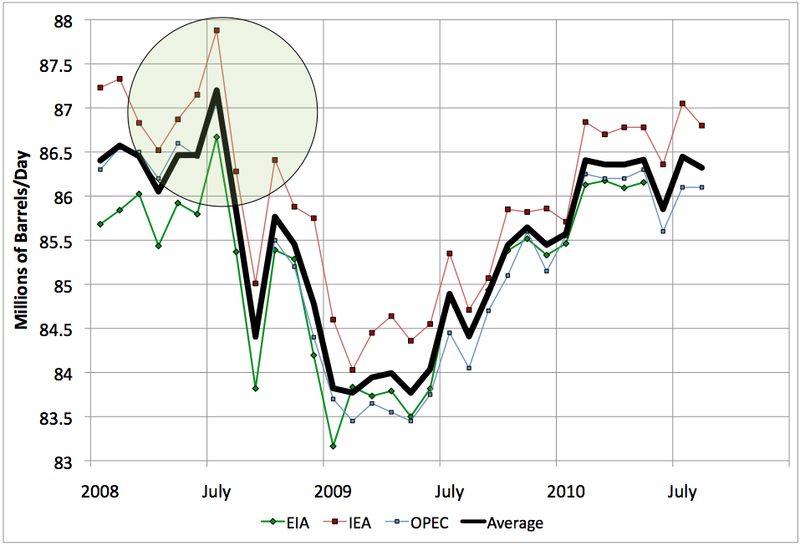 I've added that to the graph above (along with the OPEC data point I discussed yesterday). As often, the agencies don't completely agree on what's going on, with OPEC now seeing July as only a partial restoration of production cuts in June, but the IEA still seeing it as taking production to a higher level. But both concur that August is now below the level of February. So there is certainly the appearance of a trend break here. To give you some idea, from May 2009 to February 2010, the slope of the three-agency average was 0.25 ± 0.03 mbd/month, while from Feb to August of this year, the slope was -0.02 ± 0.04 mbd/month. So the slope since February is not significantly different than zero. However, the slope is significantly different than last year - the difference between the two is 0.27 ± 0.05, which is highly significant*. Prices dropped a few months ago from being over $80 into the $70s, and haven't really climbed very much since. So it still seems to me that the most likely picture here is that a stagnating global economy is not pushing prices high enough to unlock additional supply (which OPEC undoubtedly has). So what happens now? 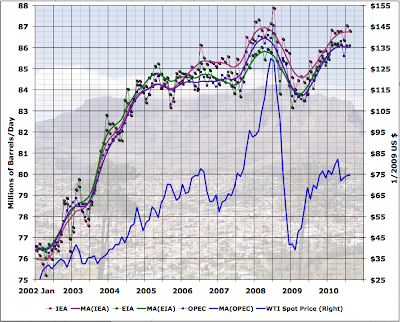 Does oil supply resume growing again and surpass the July 2008 peak? Or does it begin to go down again? My educated guess would be this: in the short term, I see the global economy stagnant. European countries are belt-tightening (especially the U.K.). The US is too paralyzed by political polarization to take much action of any kind, but the growth effects of the stimulus from ARRA are mostly over. Deleveraging still has a long way to go and will exert a dampening effect over much of the globe. In the medium term, it seems that the place to watch is Greece. 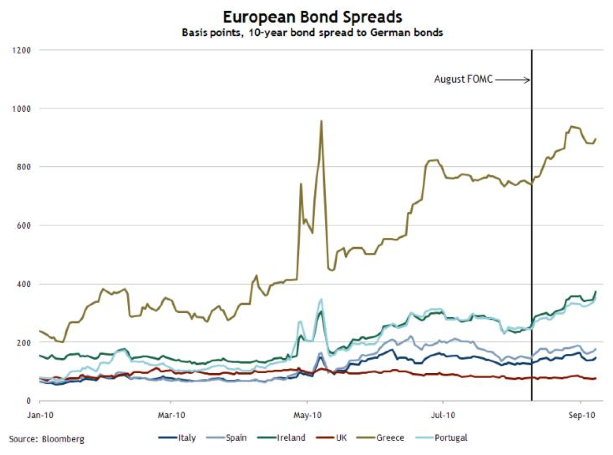 We know the European stress tests left out sovereign default, which I am cynical enough to think means that European regulators knew important banks couldn't cope with a Greek default. But it's a little hard to see how Greece doesn't default (did everyone see that amazing Michael Lewis piece in Vanity Fair?). And if it did, I assume that would trigger Financial Crisis 2.0 (probably less severe than Financial Crisis 1.0 in 2008) which in turn would probably trigger another jog down in global oil consumption/production. 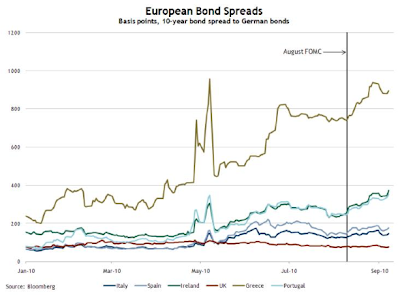 Greece is paying absolutely usurious interest rates. I guess leading reasons to think otherwise: the Fed and the ECB might, at some point, become sufficiently alarmed about deflation to start to take stronger quantitative easing measures and manage to provoke some kind of recovery. However, I have to think any such recovery could only be very shallow and temporary. In a world with a major Too Much Debt problem, lowering interest rates to provoke more borrowing cannot be a lasting strategy for fixing the problem. The other possibility is that emerging economies could continue to grow their oil consumption enough to offset falls in developed countries. But their oil consumption is still much smaller, and many of the largest emerging economies are still very export dependent. So on balance, I think it's more likely than not that oil supply will drift sideways for a while, and then fall a mbd or three in a financial shock. However, the world is a very complex place, and I wouldn't place more than, say, 65% confidence in the bet that it will break downwards rather than upwards. (*Nerdy footnote: Note that the significance would be reduced somewhat by the fact that we decided where to place the putative trend break after looking at the data, but not likely enough to erase this big of an effect). And here's another take on it. The site is I think a pearl I stumbled on yesterday. Even though I don't subscribe to everything they say, their take on MSM is such that reading it over time will be like taking the red pill in Matrix IMO. Conclusion: Promotions are most important to the elite, and the inability of the elite to convincingly implement them in the 21st century, if that is what is happening (and we argue this is so) has numerous ramifications from both an investment and real-world industrial standpoint. Most importantly, the larger generational, familial campaign of the elite to impose some sort of world governance is increasingly at risk. We have long predicted this and see no reason to revise our analysis. The crumbling of the monstrous, mainstream-media lie that is Peak Oil would be most gratifying. There's lots of wordplay happening. this Thomas Will guy actually speaks a lot of sense. Nothing to do with political aims,in fact it's imperitive now for the west to INNOVATE ways to consume less of the black stuff rather than legislate. It's not the news centrally planned governments(or proponents of it) want to hear.They would much rather seek to use a period of scarcity(artificially created or otherwise),as a means to increase their own control.......but there are quite a few people who are waking up to the game of these guys hoovering up assets internationally before such an "event"
some common ground between the US and EU(and our traditional allies like AUS and india) needs to be attained...treating each bloc as part of the same family(which basically we are),instead of a competitor,but the yanks will NEVER go for full federalisation....so we really need a "hands off" type government,that will keep at least some degree of sovereignty between countries.....charlemagnes approach to europe actually seemed to work,because he didn't want total control over everything.....so I suggest we need something broadly similar between uncle sam and the EU.......if the EU will stop grasping for more and more power. the real competition for resources will come from those "up 'n' coming economies that have not yet developed,but seek to achieve a half decent standard of living...but with about 3-4 times the population of the west. making better use of the resources we have is a no-brainer....just prevent the government from meddling. The BP disaster has probably killed off deep-sea oil drilling, which was to be the saviour of those who believed in 'infinite oil'. The United States is faced with an acute energy problem. Our dependence on imported petroleum, which accounts for half of the country’s consumption, has caused rising balance of payments deficits that weaken the dollar and contribute to inflation. More worrisome in the long run for the future of this country is the realization that eventually most oil deposits, both foreign and domestic, will be depleted. This grim specter is accompanied by a lack of control over foreign supplies, leaving us dependent on the goodwill and mercy of the oil-producing states. There are, of course, other sources from which energy can be derived, sources such as nuclear fission, nuclear fusion, solar and thermal power, and the like. But for the foreseeable future they either present many environmental threats or are not yet sufficiently developed to replace our dependence on foreign oil supplies. A sensible energy policy for the time being no doubt would rely on many different sources of energy until a more efficient, effective, and safe method has emerged. Such an approach will include the production of synthetic fuel derived from coal. This method was first effectively used by the Germans during World War II, so an examination of Germany’s situation at that time could be instructive. As a highly developed industrial state, Germany was dependent even in peacetime on external sources for an adequate supply of oil. Even though Germany’s 1938 oil consumption of little more than 44 million barrels was considerably less than Great Britain’s 76 million barrels, Russia’s 183 million barrels, and the one billion barrels used by the United States, in wartime Germany’s needs for an adequate supply of liquid fuel would be absolutely essential for successful military operations on the ground and, even more so, in the air.1 For Germany, it was precisely the outbreak of the war in 1939 and the concurrent termination of overseas imports that most endangered its ability to conduct mobile warfare. Does the government not understand peak oil or something? It's already happened to our own oil production? Or does the gov believe in the magic elexia? Do the elite that run our Gov some how think they will be imune and shielded from the riots? I believe theres plenty of Gas - both on the internet and in the ground. The Olduvai theory was introduced in 1989 by power system engineer Richard C. Duncan as the "transient-pulse theory of Industrial Civilization". The theory was backed up with data in the 1993 paper "The life-expectancy of industrial civilization: The decline to global equilibrium". In June, 1996, Duncan introduced a paper titled "The Olduvai Theory: Sliding Towards a Post-Industrial Stone Age" where the term "Olduvai Theory" replaced "transient-pulse theory" used in previous papers. Duncan further updated his theory in "The Peak of World Oil Production and the Road to the Olduvai Gorge", at the Summit 2000 Pardee Keynote Symposia of the Geological Society of America, on November 13, 2000. In 2005, Duncan extended his data set to include up to 2003 in "The Olduvai Theory Energy, Population, and Industrial Civilization". Industrial Civilization is defined in Duncan's paper as the time approximately from when energy production per capita rises from 37% of the peak value to when it falls to below 37% of its peak value (1930-2030) i.e. the peak in energy production per capita is in between these two endpoints and these two endpoints have values of 37% of the peak value. The Olduvai Theory divides human history into three phases. The first "pre-industrial" phase stretches over most of human history when simple tools and weak machines limited economic growth. The second "industrial" phase encompasses modern industrial civilization where machines temporarily lift all limits to growth. The final "de-industrial" phase follows where industrial economies decline to a period of equilibrium with renewable resources and the natural environment. The Olduvai slide (2000–2011) - 'begins ... with the escalating warfare in the Middle East... marks the all-time peak of world oil production'. 2015: US Health Care System in complete chaos, breakdown and failure; sanitation, drugs, return of communicable diseases, poorer nutrition etc. According to the Food and Agriculture Organization, global food production will exceed population growth between today and 2030. There's something a bit autistic about these charts and their hysterical timelines. Yes, everyone gets that for virtually all of recorded history productivity gains averaged little more than 0.02% per year, yet since the industrial revolution productivity shot up to closer to 3% a year, but have been softening since the 1980's. That much is pretty much agreed upon. But the fact is that no-one, absolutely no-one, can say what comes next. It may be that the industrial age was a temporary blip in an otherwise unrelenting malthusian reality. Alternatively any one of scores of new technologies, from thorium nuclear power to nano technology, from fusion to bio-engineering, could unlock centuries of further growth and prosperity. Science Historian, James Burke, wrote a book in the 70's titled 'CONNECTIONS' (also made into a tv series by BBC) which plotted the interconnections between scientific discoveries over time and how they built upon one another. Thus far, mankind has proved capable of adapting to new environmental challenges through innovatiion - thus ensuring his survival. We will face a new geopolitical reality in the 21st century......... and I hope we can use new technological advancements, such as nano-technology, for the benefit of society once we emerge from a post oil culture. It says that over 80% of the former crop land that has been bought directly or indirectly thru their phoney farm-bank companies is not cultivated! It's right there in front of you - the profit gathering hedging scum bastards of the earth are already depriving the world of crops - to force a fake shortage! I haven't seen this, could you give me a pointer? You can always be relied upon to make some irrelevant and idiotic comment about spelling, names or initiials. We have had incredibly rapid technological innovation, mostly thanks to cheap energy. You are assuming that we have enough cheap energy to continue to fuel this scientific progress. If we have reached Hubberts peak then this is almost certainly not the case. I think we can make it, but I believe we have to globally review our priorities and pull together... sadly we are all too busy killing each other over anti-science bronze age myths. AEP had something on similar lines to this.